The webOS 1.2 update changed the Clock application so the volume was aligned with the ringtone volume, something I personally love; a sensible change. But hidden within the updated Clock application were two new secret features. "sixtyten" allows the user to set the alarm in one minute intervals instead of five minutes. "4231" apparently removes the dashboard notification when you set an alarm. 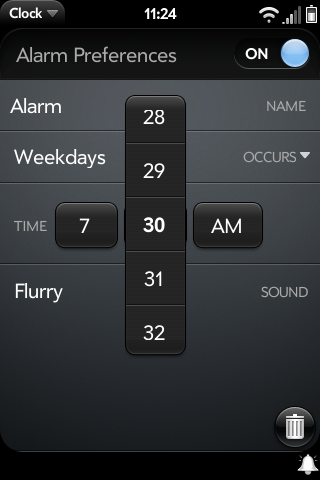 The codes get entered from the Clock's Preferences screen and take action immediately. Very handy additions. This seems to be a recurring thing with Palm: adding special features just out of reach of the average user. Whether it be finished code commented out, like add/delete launcher pages and LED notifications or coded tricks like DevMode, landscape email and these clock tricks, it's becoming a slightly odd trend. Why not just enable these features in a proper manner, so that the average, non-techy user can get more out of their device? Hopefully future updates might get this, since its pretty clear users want this. Regardless, these are welcomed new secret features and its good to see Palm making apps more usable.